Pošto nema ove teme, da počnemo: Režiser i scenarista David Goyer na sastanku sa concept artistom. Super mi je što su im na stolu poslednje DC-jeve strip verzije Mastersa. "Little MASTERS OF THE UNIVERSE update for y'all that have been asking me. The film is in "soft prep" meaning they're drawing up concept art & banging away at the screenplay. We should know in a few weeks if the film goes forward & gets a greenlight by the power of Eternia!" 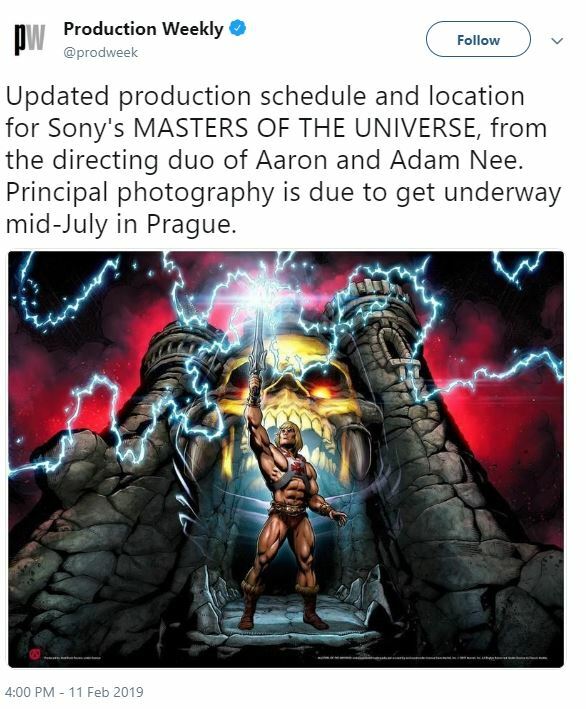 Plot details remain under wraps but like the animated series He-Man and the Masters of the Universe, the film is expected to take place on the fictional planet Eternia, as it follows a warrior named Prince Adam who turns into the heroic He-Man and battles a villain named Skeletor who is out to conquer Castle Grayskull. Escape Artists principals Todd Black, Jason Blumenthal and Steve Tisch are producing the project with Mattel’s Julia Pistor and David Voss serving as executive producers. Matthew Milam is overseeing the production for Sony. Masters of the Universe is scheduled to be released on December 18, 2019. Šta li je ovo na ekranu? Trapjaw? Nadam se da ce biti dosta te tehnologije u fucked up Eterniji, prosli He Man film je bas imao neki fini shmek sto se tice production design-a [a i Frank Langela se bas uziveo u ulogu Skeletora, sve pohvale njemu iako je film u globalu bio trash]. Jeste. Frank Langella je bio sjajan. U međuvremenu, toplo vam preporučujem kompletan DC-jev run Mastersa, završno sa Eternity War. Sjajan strip. Unfortunately for Sony Pictures, they're going to need to begin searching for a new director for MASTERS OF THE UNIVERSE pronto. Variety has reported that David S. Goyer has decided to pass on the project. Goyer was already onboard MASTERS OF THE UNIVERSE as a writer, having turned in a draft last fall that got Sony excited enough to offer him the director's gig, but after starting talks with the studio in December, it seems that Goyer has had to drop out due to other commitments. One of those other commitments is Foundation, an upcoming mini-series based upon Isaac Asimov's sci-fi series. As Sony had already slated MASTERS OF THE UNIVERSE for a December 18, 2019 release, Goyer realized that he wasn't going to be able to juggle both projects. Goyer will remain involved with MASTERS OF THE UNIVERSE as screenwriter and executive producer, and before he departed, Sony was even getting ready to start talking with actors. The studio is still confident that it can make its release date and is currently meeting with other potential directors, meaning that we'll likely be hearing something on that front quite soon.